A few Saturdays ago I'd had a bit of a rubbish day and as I was very close to a Lush store, I decided to buy some make-myself-feel-better treats. One of these treats came in the form of the Holly Golightly Bubble Bar. At £4.75 it's quite an expensive bubble bar, but at the time that didn't matter...! 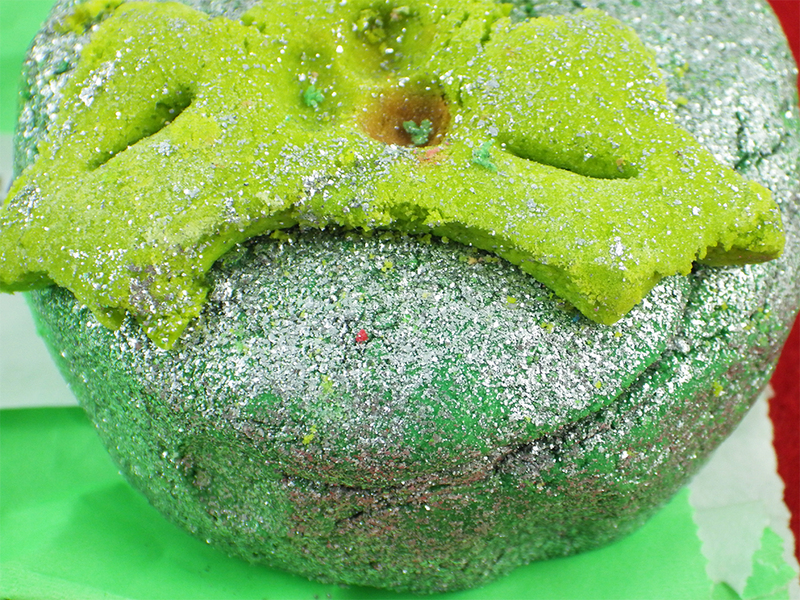 Holly Golightly is quite a large, thick bubble bar and looks like a brightly coloured, shimmering Christmas cake with a sprig of holly on top. What attracted me to it is the scent - containing Patchouli, Persian Lime, Clove Leaf and Sweet Orange Essential Oils you get this gorgeously festive aroma that is spicy and warming, but still has a hint of sweet citrus. 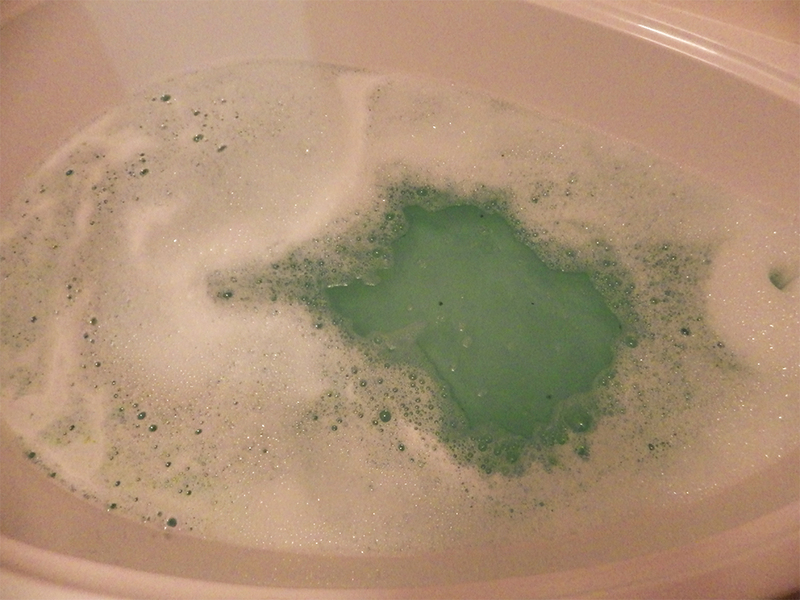 I got two uses out of Holly Golightly, each time enjoying a layer of foamy bubbles and water that turns into a rich green. The scent is perfectly balanced; it's refreshing but not too uplifting for an evening bath and it's relaxing but won't make you fall asleep! The only thing I would say is that's a bit too subtle - I don't whether this is simply because I used half of the bar each time or whether this is how it's meant to be. However it is a gorgeous scent and after discovering that the shower gel Hot Toddy has the same scent, I have added it to my wishlist. You can find out more about Holly Golightly or buy it for yourself online here. Have you tried the Holly Golightly Bubble Bar? 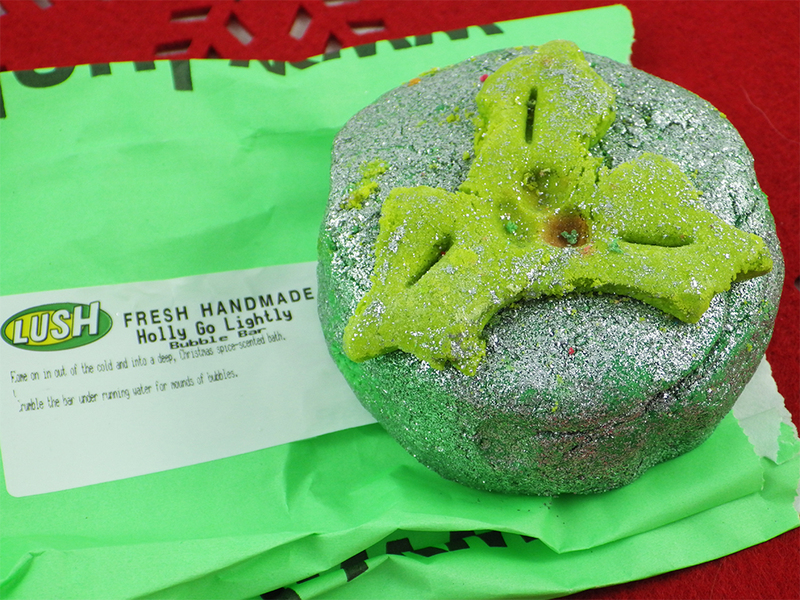 What products are you loving from this year's Lush Christmas range? Gosh, that is pricey but not bad considering you get two uses out of it. I definitely want to try it after reading your review! It looks so glitter and pretty. Wish I could get myself one but we don't have a lush store in barcelona :( Soon hopefully we will. Nothing like some Lush goodies to beat the blues! I've not tried this bubble bar but the scent sounds lovely! I recently ran out of all of my Lush stuff and I'm so sad, baths just aren't the same! I can't wait to restock and would give this one a go as I have never used it. I was always really wary of the glittery ones but thankfully the glitter doesn't really stick to the skin!